Some of my songs and instrumental compositions can be found here. The first song, The Reason Why, is actually called 'For Sophia' and came to me after my first meditation retreat (a long time ago now). This song used to be performed at The Basement in Sydney by the excellent vocalist Kerrie Biddell (now sadly no longer with us). 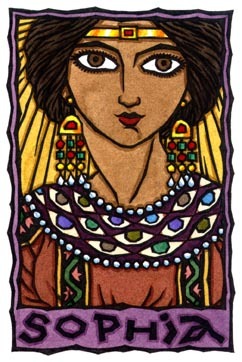 Sophia is, of course, 'the spirit of wisdom' - here is a graphic of her that I have always liked. thanks for sharing (jonathan?) ! Hey thanks! I played guitar for a long while but switched to keyboards in the end. Nowadays with the software instruments that are available, if you can play keyboards you can emulate any kind of instrument. I'm really not trying to put drummers out of business, but for my recordings I had to use drum tracks. I do hope you had a listen, El G.
Very good. Enjoyed the first song very much. I’ll try to remember not to eat your relatives in future. Amanda Jane, written by Roger Hubbard, filmed and played by "spike"